Successfully Added Handheld Electronic Metal Detector (Extreme Detection Edition) to your Shopping Cart. Professional Handheld Metal Detector with extreme sensitive metal detecting ability. This extreme sensitive metal detector can detect any objects, from small coins at 2 inches away to guns, knifes and metal bars at 6 inches away. 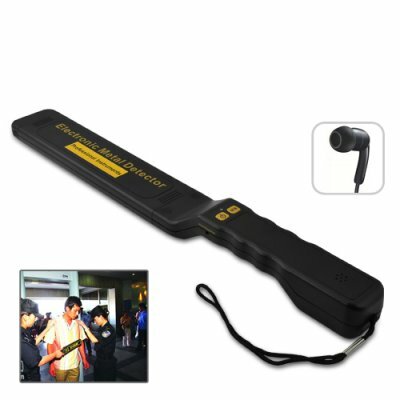 This professional grade metal detector can be used in a variety of scenarios, from airport security to night clubs and bars. This is a powerful handheld portable metal. Whit it, you can cut down knife and gun related incidents in your entertainment establishment/business and deter away those who seek to ruin everyone’s enjoyment and fun. This device can be used to detect any type of metal from as far as 10 inches away with an adjustable sensitivity feature. This unit has a vibrate mode as well as a high tone mode to serve a variety of conditions. This security metal detector is ideal for keeping your event secure, and is perfect for concerts, schools, restaurants or bars. Simple to use, all you have to do is wave the metal detector along a person and the scanner will alert you to any potentially dangerous devices that may be on the person. Peace of mind is just a wand wave away! Click "Add to Cart" now, and we'll express ship you a sample straight away. This new professional metal detector also makes a great resale item for your personal/company use, resale market, online or physical store or your eBay shop, and it's brought to you at a factory direct price from the leader in wholesale electronics, Chinavasion. Good for use outdoors or indoors. Is this metal detector the same as those used in airport security? Yes, this is a professional grade metal detector, it can be used in entertainment, commercial or industry application. Can this metal detector also be used for treasure hunting? Of course, although for treasure hunting, you might consider our popular Treasure Hunter - Metal Detector [http://www.chinavasion.com/product_info.php/pName/treasure-hunter-metal-detector-for-standard-precious-metal/].